Bob on the tracks (alpine coaster) is a kind of roller coaster that represents the mountainous summer attraction, but can sometimes be used in winter. This adrenaline content represents a specialized course for lowering through the natural forest environment. The installation is equipped with a special sled, attached to the rail system that can be used by adults and children accompanied by an adult on two-seat sleds. Movement is made due to the natural inclination of a circuit. Starting station is located on left from station Cross (Krst). After boarding, the sled system will "pull" you up to the point where moving adrenaline pleasure due to natural inclination. Exit station was built at the place where lift Krst cuts the eponymous track. 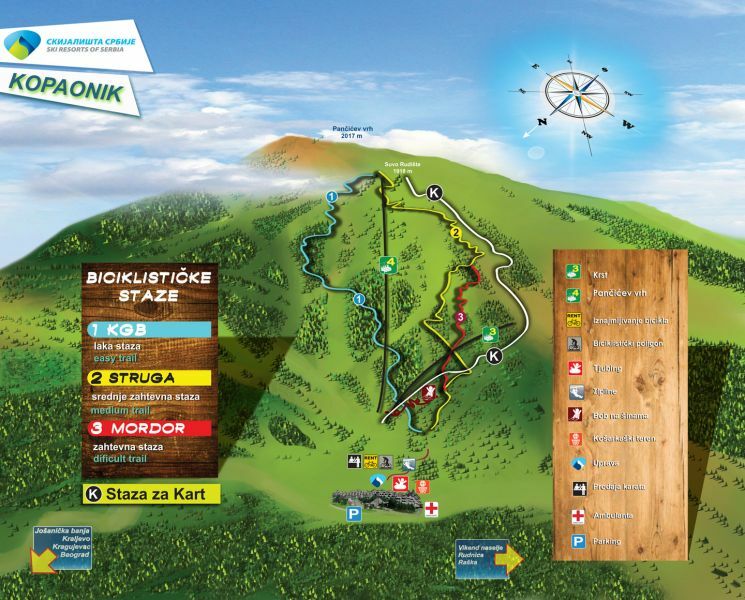 The route of the entire track is located in a forest environment through which bicycle trail also passes to the Pancic Peak. Sleds are equipped with seat belts and in order to avoid problems with safety, speed is usually limited up to 40km / h. Such installations are very popular in Italy, Austria, Germany and Switzerland, and Kopaonik Bob rail is the first in this part of Europe. Designer and manufacturer is well known German company "Wiegand", which is set in the world of more than 300 such plants. The construction is made of stainless steel and tubular rails make bob sled run smoothly and quietly down the slope. The sled can carry one or two persons. Sled driver has the ability to control the speed, and this gives it a unique hands-on experience and encourages him to re-ride and faster descent. Driving a path that is set from 1 to 6 m above the ground is an exciting and diverse. Jumps and waves embedded in the track caused even more excitement while driving. Rain and snow are no problem - Excellent braking effect remains unchanged. Wide track with two tubular rails guarantees optimum cornering stability without tipping over, smooth ride and comfortable and secure feeling for drivers.